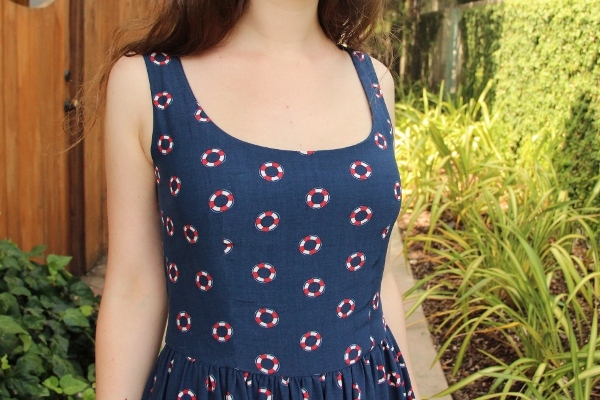 This year, to celebrate the 4th of July (and the long weekend that goes along with it) I made a nautical/patriotic dress in blue, white and red, the colors of the french american flag. Wait, what do you mean the 4th of July was already 3 weeks ago? Well, I guess I have a lot to catching up to do here! 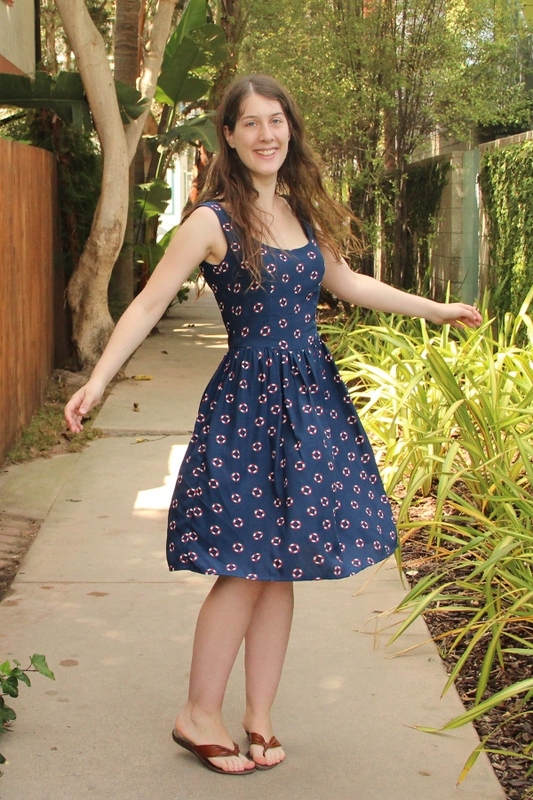 For this dress, I used one of my favorite patterns, the Dolce Vita dress from Burda 02/2011. I already made it twice (this one and this other one, in French sorry! ), but this time I made a few modifications. First, I mixed the pattern number 101 (the Dolce Vita herself) with the 104, which has large straps instead of cap sleeves but is in “petite” sizes. 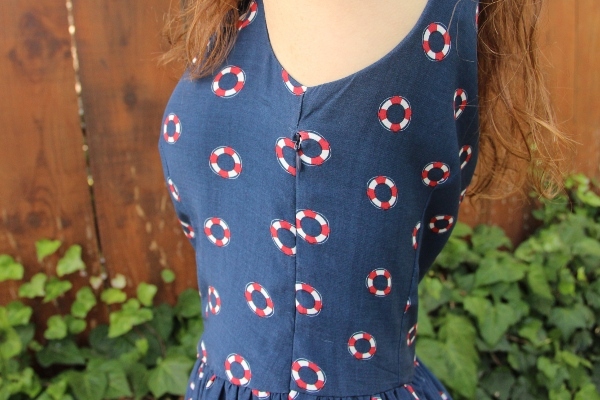 I really like the previous version I made of this dress (the one in Dr Tulloch Liberty) but I am always annoyed by the neckline that is a bit too low and gapey, so I brought it up a bit: using the petite pattern, I traced size 18, with the length of size 19 and the neckline of size 21 so that it would be higher (and the whole mix roughly coresponds a size 36). It is close to perfect, but next time I will remove one or two centimeters in the center front and back because it stills gaps a bit. 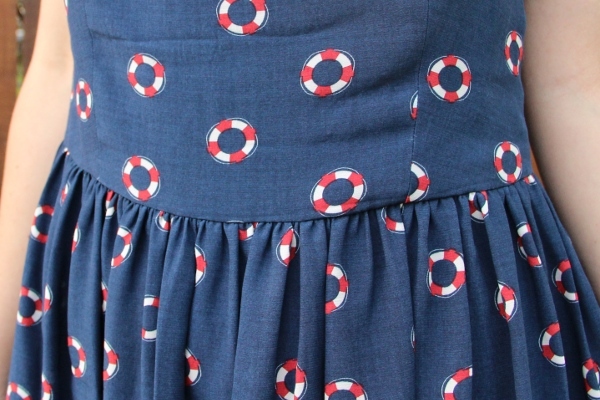 To continue with the summer stashbusting, I used a printed rayon (with life preservers on it!) that I bought at Sacré Coupons in Paris just before I left. I love rayon, this is the only fabric I want to sew and wear now! 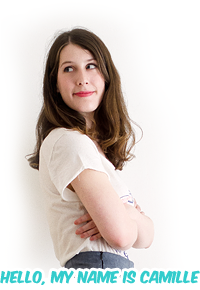 It’s really more fluid and comfortable than cotton, especially when it’s hot (I mean, as long as I don’t sweat too much, because seeing how rayon becomes awfully rigid when wet I’m betting it wouldn’t be that comfortable…). I sewed this completely last minute before I left for the weekend, in one evening and a couple of hours the next morning. 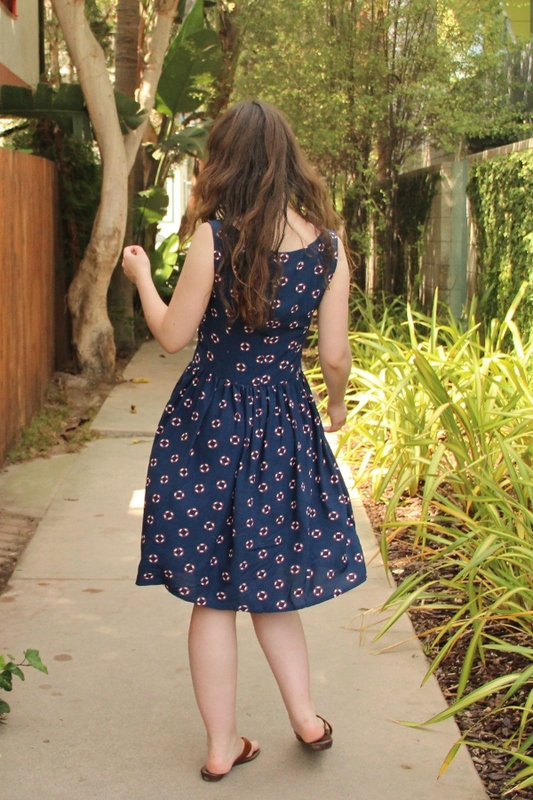 So I didn’t care that much about matching the pattern at the seams, but I guess it’s okay. I was really careful about the gathers though, I used the 3-threads techniques that gives very even results. I’m pretty happy about my invisible zipper too, especially considering that since I switched to another machine I don’t have my invisible zipper foot anymore (and it made my life so much easier! I have to get a new one soon somehow). 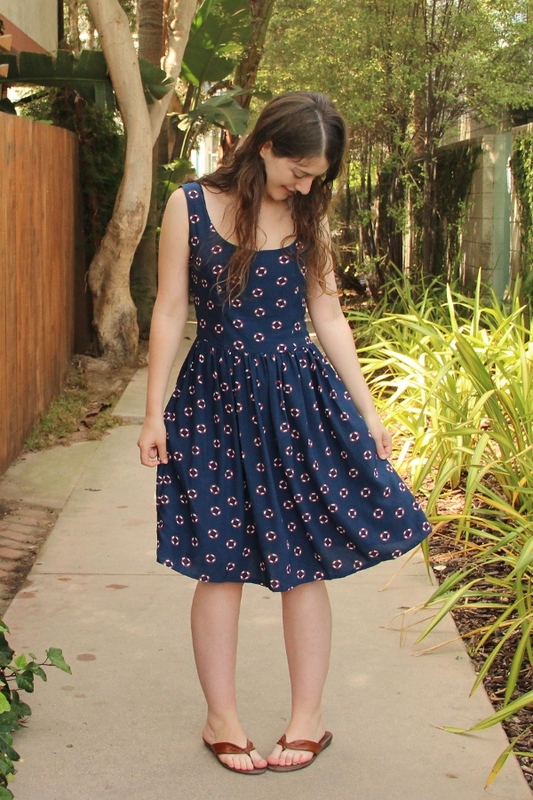 It’s my favorite handmade dress so far, I’ve been wearing it non-stop for the past month! 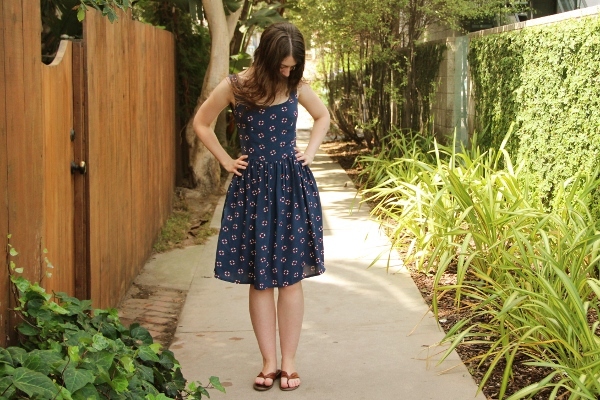 It is comfortable yet flattering, fun but still work-appropriate. I really need to make more like this! This is gorgeous! 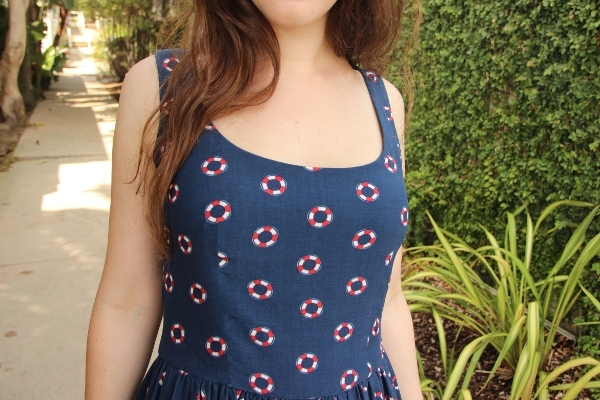 Love the fabric, and it’s just the thing for hot weather.